As I have no close connections with this week’s Sepia Saturday theme of people involved in the First World War, and know very little about them anyway, I hadn’t intended to do a post this week But the maximum temperature in Geelong today was 45 ° C,and the last three days were 41°, 42° and 45° (106, 107, 113F), so it seems like a good time to continue with the story about Charles Fricke Snr. which I started in Attached to a Moustache. and which I ended by saying ….. But in 1898 the bushfires came through and destroyed everything. It was time to start all over again. But that’s another story. .I have told this story in other places but I doubt that other Sepians have seen it. Just like this week nearly one hundred and sixteen years ago each issue of the Geelong Advertiser was reporting on bushfires, whether they were in Tasmania, Gippsland , the Grampians or closer to home. 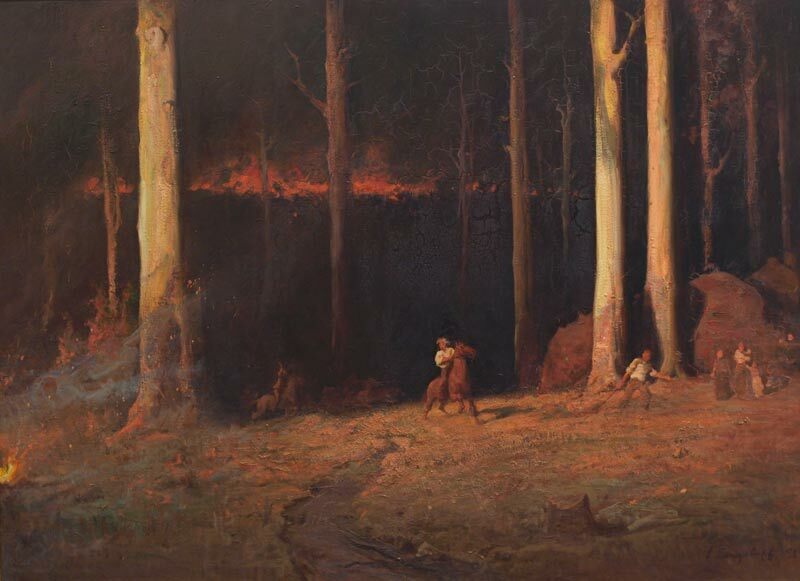 The dry weather had brought swarms of locusts through the area and by February 1, 1898, Beech Forest was described as being ablaze, just one of the many fires that had been devastating the Otway Ranges. 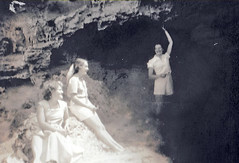 For two days Colac had been enveloped in smoke, turning day into night. 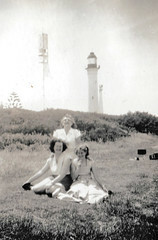 The Otway Forest was fast coming into prominence as a tourist resort. Distinguished visitors to the various small communities were reported, as were the Balls and Sports Days. 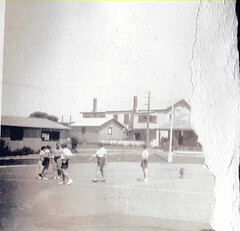 On Tuesday, February 8, 1898, the Gosney and Cawood houses were full of visitors at Apollo Bay. It wasn’t a particularly hot morning, but the wind was gusty. When the wind swung to the north the burning off which had been started by the Beech Forrest settlers got out of control and headed towards Apollo Bay. About 11.30 in the morning Charles Fricke Snr. was helping his next door neighbour, William Methven. They saw the fire making for their houses at the top of the ridge at Tuxion, in the hills above Apollo Bay so began to hurry back to their homes. Charles Fricke reached Mr Methven’s house first and stopped briefly for a drink of milk, the older man having lagged behind, then hurried to his own home. There was little Charles Fricke could do to save his home. The fire was so intense he crouched behind a table with a bucket of water for five hours, tearing the back out of his waistcoat to dip in the water and cover his mouth. The table was too small to cover his feet and the heat drew the nails out of his boots. His horse was the only one of his animals to survive the fire, even though he had his mane burnt off. Alone, blinded by the heat, he decided he would rather die on the road to the township where his body would be found more quickly, and so feeling his way with a stick he set off on the three miles to Apollo Bay. Mrs Costin took him in and put him to bed and nursed him back to health. After a long search Mr Methven’s body was found and the subsequent inquest decided that on seeing his home destroyed Mr Methven had tried to make for a creek to find refuge, but had been overcome and suffocated by the hot fumes. The Murrays were trapped on the top of a ridge and spent the night there under a wet blanket, taking it in turns to throw water on one another. They had lost everything except one cow. Indeed the Marriner, Methven, Murray, Fricke, Cross, Armstrong, Bulotte, Perkins, James, Kendall, Inkester and Evans homes, and four untenanted houses, were lost, as well as miles of fencing, pasture, livestock and orchards. This day was later called Red Tuesday. As the telegraph line was burnt down the news of the fire had to be taken out by horseback. The coaches could not get through as the track became blocked and the corduroy was burning. So it was Friday before the people of Geelong could read about the fire. N.B. A corduroy road is made from logs placed across the road, particularly in swampy areas. After eight years of clearing scrub, splitting palings, fencing, building, and creating a farm, it was a case of start again. First priority was shelter. 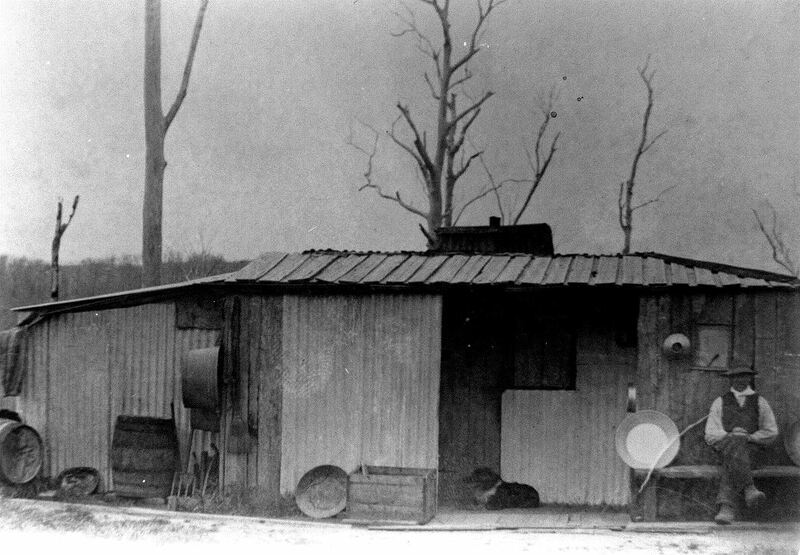 Charles Fricke built a temporary humpy using the roofing iron from his burnt home. The property had to be re-fenced and re-sown with grass seed. The Gippsland settlers had bought all the available Cocksfoot grass-seed so seed had to be imported from a neighbouring colony and unfortunately brought with it the seeds of the Ragwort weed. Charles then built a new home, married and had his first two children while on this farm before shifting to another farm closer to Apollo Bay. This story was told from Charles Fricke’s reminiscences and newspaper reports. Meanwhile there were similar fires in Gippsland in the eastern part of Victoria where 12 people were killed and 2000 buildings destroyed. 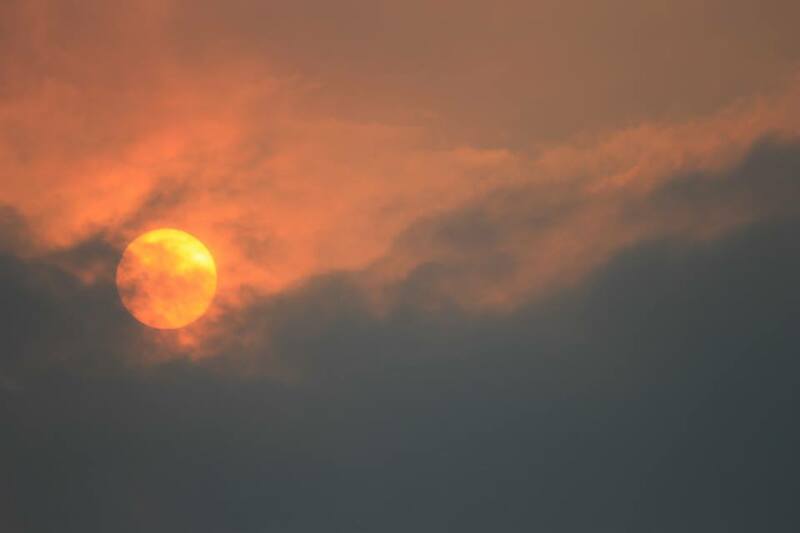 And this is how the sun looked this afternoon in Geelong thanks to “John” of Belmont on Facebook. . The bushfires are a long, long way away but the wind carries the smoke over long distances. This heat wave is now over – the cool change has arrived. So next week I’ll be back to the regular theme and a cold weather post, And that reminds me that we still measured temperature on the Farenheit scale when I got married and on that January day it was 108° in the shade. It didn;t seem that hot. 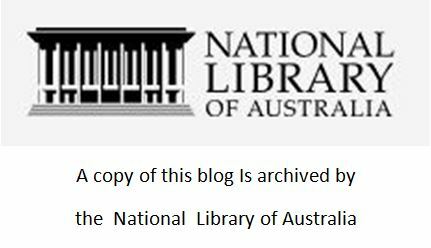 This entry was posted in Apollo Bay, Family History, Family Stories, Farming, Genealogy, History, Uncategorized and tagged 1898, Apollo Bay, Beech Forest, bushfire, Charles Fricke, Cocksfoot, Corduroy road, Fricke, humpy, Otways on January 17, 2014 by lazycoffees.